There's a rich history behind California's signature barbecue style that can't be found anywhere else. At its heart, Santa Maria barbecue is a simple style, just meat seasoned with a dry rub consisting of salt, pepper, and garlic salt, cooked over a large, iron grill served along with the traditional side of pinquito beans. 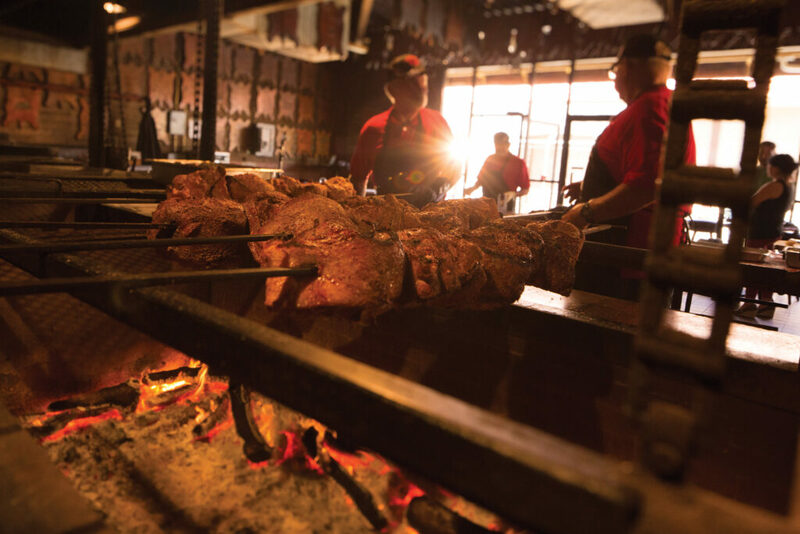 If you're like us and you can't get enough of Santa Maria style grilling, we have some easy tips on creating your own Santa Maria barbecue. Here are the secrets to Santa Maria style grilling at home. With roots that date back to the 1800s, local ranchers would prepare a Spanish-style feast after cattle round-ups for vaqueros (cowboys). The meal consisted of meat slow-roasted over the flames of a red oak fire, served with a side of pinquito beans and a fresh green salad. While the tradition has since grown to include tri-tip, one defining feature has remained the same: to be considered Santa Maria Style Barbecue, it has to have been cooked over red oak, native to the Santa Maria Valley, and preferably rubbed with Santa Maria seasoning—a simple-yet-flavorful blend of salt, pepper, and garlic salt. Today’s classic Santa Maria Style barbecue plate typically includes: red-oak roasted meat, pinquito beans, fresh green salad, and grilled French bread dipped in sweet melted butter. Red oak chips (Don’t skip this! It’s what gives the meat that authentic Santa Maria Style flavor). A smoker box or aluminum foil to make your own “pouch” for the red oak chips. Premium top-block sirloin or tri-tip (do not trim the fat). Santa Maria Barbecue Rub – Purchase from Susie Q’s or make your own by mixing 2 tbs. salt with 1 tsp. black pepper and 1 tsp. garlic salt. Soak approximately 1-2 cups of red oak chips in water for 45 minutes. While the chips are soaking, get your charcoals going on your grill. Once your charcoals are ready (the top coals should look grey and ashy), add your red oak chips to a smoker box and place the oak-filled smoker box on your grill rack. Or, if you don’t have a smoker box, place your wood chips at the center of a square piece of foil. Fold the foil around the oak chips to create a pouch. Poke 4-6 holes in the top of the pouch to allow red oak smoke to escape. Place pouch directly on your grill rack. Use premium top-block sirloin or tri-tip. Keep the fat on your cut of meat (You can trim after cooking but leaving the fat on for cooking makes for more flavorful meat). Pat down your meat with a paper towel before applying the rub. Absorbing the excess moisture before cooking will allow the meat to sear evenly. Spread your Santa Maria Style rub evenly across the entire surface of the meat, and massage it gently into the meat until the entire surface is covered in the rub. Set aside or refrigerate until your grill is ready. Starting with the fat side down, sear your meat quickly directly on a hot grill rack to seal in the juices. While searing, close the lid of your grill to help lock in the flavorful smoke from the red-oak pouch. When juice appears at the top of the meat, it is time to turn it over. Turn it over and cook until the desired doneness, keeping the lid closed. Medium rare is recommended – which typically takes 20 minutes per inch of cut thickness. When the internal temperature of your meat reaches 140 degrees, it’s time to remove it from the grill to let it rest (Or, 155 degrees for medium; 165 degrees for medium well). Remove from the grill and let rest for 3-5 minutes before cutting (If you cut the meat immediately after removing from the grill, the juices will escape). If you wish, trim the fat after cooking. For tri-tip, slice against the grain the long way, not across the triangle. It won’t be a uniform cut, but it will be far more tender. Serve with pinquito beans, a fresh green salad, and Santa Maria Style salsa.